Morocco, along with most other countries in the MENA region, faces enormous challenges, both in terms of high unemployment rates and migration within and outside of the country. On average, 70% of the region’s population is under 29 years of age and 50% of those unemployed; the problem is not necessarily the lack of jobs, but rather the lack of employable skills and education, especially among disadvantaged populations. 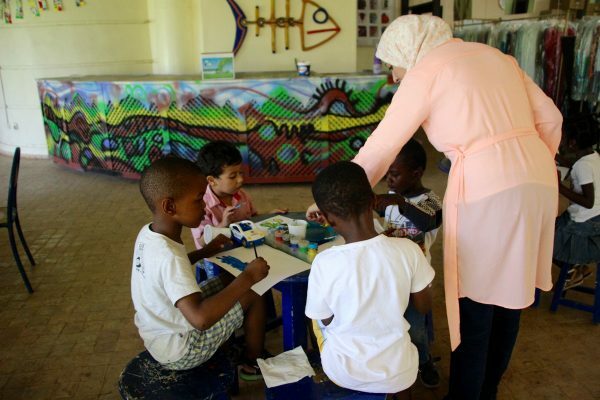 In addition, in recent years a steady influx of young refugees and migrants who have fled areas of instability and conflict have joined young Moroccans in the struggle to find work and integrate into Moroccan societies. For this reason, the Foundation Orient Occident is committed to the issues of both migration and unemployment; this is done by promoting integration, providing social and psychosocial support, training programs, education and intercultural activities. In order to remedy the lack of professional skills for the long-term unemployed in Morocco, the Foundation Orient Occident has set up vocational training centers in different disadvantaged neighborhoods serving more than 8,000 beneficiaries per year. The beneficiaries are selected on the basis of an assessment of their life situation, needs and motivation. In its six centers, the Foundation Orient Occident offers young people vocational training in areas such as hospitality and computer science. We fight against the exploitation of small maids, and more generally against the exploitation of minors and their work, in four regions of Morocco most affected by the social problem, with the creation of a platform of associations joint in the fight against the phenomenon and with field study and diagnosis.